In 1655 a party of six men met with the representatives of the Setalcott Indian tribe near the present community of Setauket and negotiated the purchase of the first tract of land in the town of Brookhaven. The settlement in Setauket was the principal settlement of Brookhaven Town for many years. The area in the middle of the Island was referred to as “the plains” and remained unsettled for 75 years. In 1720 action was taken by dividing large tracts of land among the 54 proprietors of the Town. On Jan. 16 1720, land on the East Side of the Connecticut River from Yaphank north was divided into 54 lots. On April 17 1728, the land north of Middle Country Road was east of Miller’s south path was divided into 54 lots beginning at the eastern boundary of the Town. This was called the Wading River Division of Great Lots. On May 4 1731, fifty-five lots were laid out on the south side of Middle Country Road beginning at the Smithtown Town line and running eastward to the Connecticut River. These lots were bounded on the south by land of Winthrop’s patent. On Dec. 10 1733, the Town laid out two divisions of 55 lots each on the south side called the East or Great Division and the West or Little Division. These were bounded on the east by Major Smith’s land and on the west by Governor Winthrop’s land. They ran north to “the middle of the island”. On March 10 1734, two divisions of 55 lots each called the West and East Division of Long Lots were laid out on the north side of Middle Country Road beginning at the Smithtown Town line and ending at the Wading River Division. A second division of lots between the Connecticut River and Yaphank Line was made April 14 1739. This was north of the earlier division and ran north to Middle Country Road. The above divisions of land completed by 1739, together with Major Smith’s land covered all of what over 200 years later would become the Longwood Central Schools. In 1738, the Town laid out 14 acres to Captain Robert Robinson on the south side of the Country Road, just east of the house of Daniel Brewster, and west of the “great pond” (Artist Lake). This is the first record I have found of a house in Middle Island. Daniel Brewster’s father was Daniel Brewster Sr. who was the Town Clerk from 1712 to 1737. His grandfather was Nathaniel Brewster, who was minister for the town (at Setauket). In 1745, Stephen Swezey of Southhold bought 150 acres in this wilderness. Stephen was the grandson of John Swezey who was one of the six men that bought land in 1655 from the Indians in the Setauket area. The Swezey (Swazey) family is descended from John Swesye who was born in France in 1474 where a son William was born in 1496. They left Normandy in 1524 and settled in Weymouth, Dorsetshire, England. John Swezey of Southhold was born in England in 1600, the son of Israel Swazey of Wales. John emigrated to Salem Mass. in 1629 with two sons Joseph and John. In 1652 John moved to Southhold and in 1661 received an allotment of land in Aquebogue where he settled. Within twenty years after purchasing his first 150 acres in Middle Island, Stephen had increased his holdings to 1000 acres, which would cover much of the West Middle Island area. His homestead was located just north of the upper Swezeytown pond. The land was divided among his five sons, Stephen, Christopher, James, Daniel and Abel. 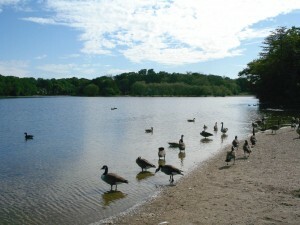 The son Stephen received land from Half-Mile Pond north and built a dwelling 40 rods north of the pond. Christopher’s land was about 1000 ft. west of Half-Mile Pond. 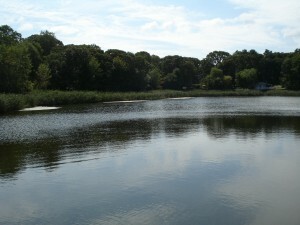 James received land in 1747, which extended north from the Country Road to the upper Swezeytown pond. He built a house about 150 ft. southwest of the Half-Mile Pond. Most of his descendents moved to Huntington. Daniel’s land was west of the above three brother’s and many years later became the Wellington Farms. Abel received his father’s dwelling just north of the upper pond. After Abel’s death his family moved to East Patchogue. The last owner of this land was Elbert J. Swezey, who sold it in 1923. Before the 20th century, Middle Country Road through Middle Island was a dirt road and a traveller entering from Coram by horse and wagon would see only a few houses. With the exception of 3 or 4 all of these houses would be on the north side of the road. The descriptions that follow uses the names shown on the 1873 “Atlas of Long Island” by Beers, Constock & Cline, to identify these houses. Immediately upon entering the West Middle Island School District, the home of Samuel Buel Swezey (1823-1917) appears on the left. Samuel was the son of Isaac Swezey (d.1856) who was the son of Isaac (d.1807) who was the son of James (1720-1786). The house was at the southwest corner of what became the Wellington Farm of Arthur W. Teele by 1917. That land extended east to Swezey Lane. Just east of Swezey Lane was the home of Oscar F. Swezey (1806-1874), which passed to his son, Sylvester M. Swezey (1827-1904). Oscar was the son of Stephen Swezey (1756-1833). It was the location of the C.H. Hagen hotel and store by 1900. In the 1930’s Frank Hines built a tavern at this location, which later was owned by Tim Cronin and then in the 1960’s became the Island Squire restaurant for several years. A short distance south of the highway opposite to Swezey Lane is shown as the home of T. Longhing, about whom I know nothing. This is about where William Wycherly lived in the 1930’s and 1940’s. Also about half a mile south of the highway, just past Swezeytown Road, was the home of Azel R. Swezey, who was the son of Isaac (d.1856). This property passed to Azel’s son Christopher (1844-1926) and then to Edward F. (1872-1942). The next home on the north side of the highway was the residence of Mrs. Nancy King, located at the northwest corner of Church Lane. Nancy was born Feb. 10 1812 and was the daughter of Christopher Swezey of Yaphank. She was left the home by her husband Thomas J. King (1812-1871) whom inherited it from his father Rev. Ezra King (1784- 1867). Rev. King was born in East Marion and became pastor of the Presbyterian Church in 1810. After the house burned, Nancy King lived with her daughter Lydia whom had married Joseph H. Randall in 1871. Another house was later built on the site, which was the home of Lawrence Kaminski in the 1930’s and later Mrs. Martha Wissman. On the east side of Church Lane (then called the Road to Half Mile Pond) was the Presbyterian Church about which much has been written by Thomas R. Bayles (my father). 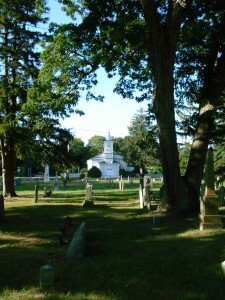 About 500 ft. east of the church was the home of Edward A. Swezey (1820-1890). He was the son of Joshua (1763-1843) who was the son of Daniel Swezey (1725-1777). Daniel probably built the house about 1750. Richard M. Bayles was Edward’s nephew and made this his home until he was married in 1893. The 1917 atlas shows H.C. Swezey as owner. Later it was owned by Charles Diffenbach and in the 1950’s and 1960’s by Emil Lengyel. The house finally burned about 1997. The road then turned to the north to skirt a swampy area, which drained into Bartlett’s pond to the south. Just around the bend on the left side was the Presbyterian parsonage. A couple of hundred feet east of the parsonage was the junction of a road which ran south to Bartlett’s pond. Before reaching the pond houses are shown belonging to H.W. Swezey and M.E. Swezey. At the south end of the pond was a house, which had belonged to Buchingham, before the land was acquired by Judge Willard Bartlett. Judge Bartlett built a home several hundred feet south of the pond between two very small ponds. Back on the north side of the Middle Country Road and opposite the Bartlett Road junction, the map shows homes of N. Hudson and Mrs. M. Hudson. One of these became the home of John Butler, later Sophia Butler and later in the 1930’s was the residence of Fred J. Zimmer. In the 1940’s Mr. Lymber and family lived there. The next property to the east was the George W. Ritch (1825-1899) estate and residence. This passed to his son Lewis E. (1869-1966) who in turn left it to his son Raymond (1904-1971). Raymond moved from the house in the late 1960’s after selling the property and for the next 25 years the property became overgrown. The next property to the east was the Daniel Petty farm with the house located about 2,000 ft. north of the highway. Adjoining the Petty farm on the east was the Henry P. Hutchinson farm. In December of 1892 Richard M. Bayles bought a half-acre from Mr. Hutchinson where he built a home the following year. Opposite the above property on the south side of the road Joseph H. Randall built a home after the 1873 Beers atlas was published. Further to the east on the north side of the road at the bottom of the hill was the homestead of Benjamin T. Hutchinson. On the south side of the road opposite the B.T. Hutchinson home was the home of P.S. Thompson. 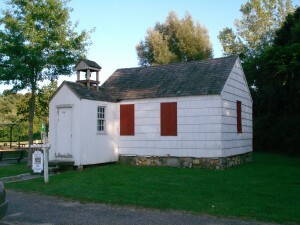 Just east of the Thompson house and about 500 ft. south on the road to Yaphank was the East Middle Island schoolhouse. A couple of hundred feet east of the schoolhouse on the north side of the highway was the store of Horace G. Randall. A short distance east of Randall’s store was the home of H.D. Petty, which was acquired by Marion Van Horn in the early 1900’s. In the early 1930’s the house was moved a hundred feet or so to the northeast and became part of a new house that Mr. Van Horn built. Shortly after 1995 the widow of Mr. Van Horn went into a nursing home and the property was sold to the Middle Island Fire Dept. In about 1998 the house was burned. East of the Van Horn house was the home of J.W. Rose. I believe that this was the house occupied by Charles Campiche in the 1930’s, which stood just opposite the west part of Artist Lake. A little further east was the home of Dr. Abner Van Horn, which was located on the northwest corner of Middle Country Road and Corwin’s (later spelled Curran’s) Road. By 1940 this house was pretty well deteriorated and eventually succumbed to old age. On the south side of the road at the east side of Artist Lake was the home of E.D. Carpenter. Just east of the foregoing home was the home of H. Balling, which may be the home later belonging to Bosch. Back on the north side of the road and overlooking Artist Lake was the home of Alonzo Chappell. A short distance east of the Chappell home was the home of J.R. Crawford about which I no nothing. On the atlas it appears to have been a short distance north of the highway. East of the above house was the house of J. Risley.